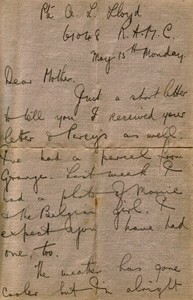 Letter from Lewis Lloyd to his Mother dated Monday May 15th. He mentions the weather and other letters he has received. He also talks about how the newspapers are getting thinner and there is less news. 1 page. 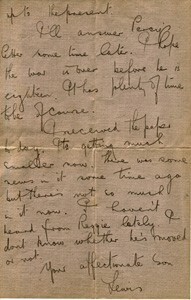 With original envelope addressed to Mrs WH Lloyd. Stamped ‘FIELD POST OFFICE 3 A MY 17 16’ and ‘PASSED FIELD CENSOR 1686’.